My new series “The Rhythms of Memory” is inspired by my journey with my mother as she struggled with dementia – arguably the most feared disease that happens to be incurable. This is the story behind the painting you see above. I began the painting with multiple layers, adding texture as I went along, representing the abundance of plaques and tangles found in the brain of dementia patients. One question I constantly hear from those with dementia is “What time is it?” In fact, losing track of time is an early symtom of dementia, they often loose track of dates and even the seasons of the year. As the dementia progresses, routine and structure become more important to them, it helps ease their anxiety and confusion. Knowing all of this, I placed a clock face into the painting. 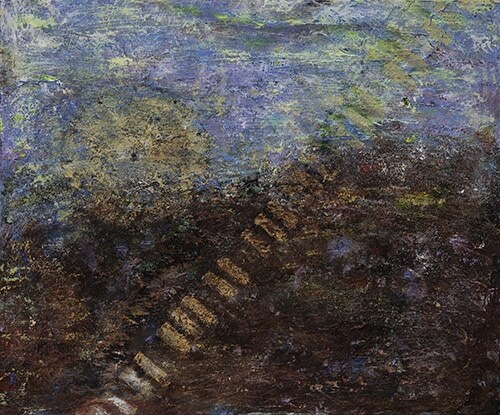 I also painted a hill with the steps, illustrating the daily struggles they face. The steps have a rhythm that mimics the notes on a piano keyboard – this was intentional. Music has been proven to improve memory. Watch the short video I posted below of Henry’s transformation after hearing one of his favorite musicians, Cab Calloway. This is something we have known for a very long time. After all, Plato lived from 427-347 BC! Do particular songs evoke certain memories? Have you ever reacted to music the way Henry does in the above video? I’d love to know about it! I used the term “dementia”. Alzheimers accounts for 60-80% of all dementia cases (depending which study is referenced). Click here if you want to read the !0 Early Signs of Alzheimers. This entry was posted in alzheimers, music, VICKIE MARTIN ART and tagged Alzheimers, Music and Memory on February 4, 2019 by vickiemartin.